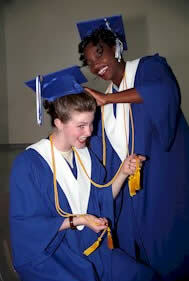 Traditional Graduation Caps and Gowns are available for High School, Elementary & Middle School. Each set comes individually wrapped with a cap, gown, tassel, and year date on the tassel. Color choices include white, gold, royal blue, light blue, gray, purple, black, navy and maroon/burgundy. Select your style and color, and the quantity you want to order. Elementary - Middle School and High School gowns are available as pictured above (traditional style). High School gowns are available in either the traditional fabric or our VIP fabric. The VIP sets are the same style as the traditional but slightly less shiny. Most high schools use either our traditional or VIP sets. If however, you are a school looking for a higher quality RENTAL QUALITY gown, one designed to be worn over and over again, year after year, as a means of saving the cost of annual rentals, we could special make you rental quality high school cap and gown sets. Each set comes individually wrapped with a cap, gown, and dated tassel. Prices depend on the total number purchased, as we offer quantity discounts.